I’d like to take this moment to come out and admit that I am sort of really addicted to Rockabye Baby. I know for a fact that I enjoy the Coldplay album way more than I probably ought to. Anyway, moving on. 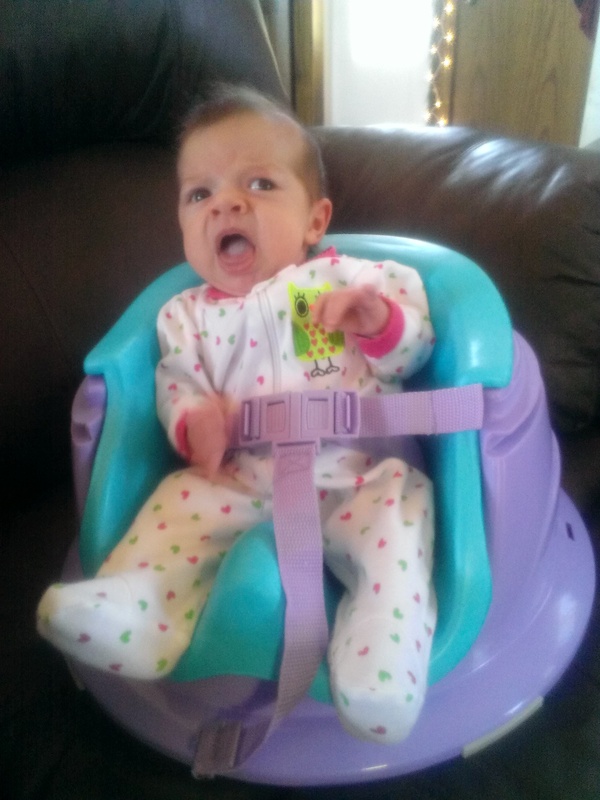 On Friday, I took the baby to her doctor to ask yet again about her excessive crying and colic. That, and the fact that for almost 2 days straight, she refused to nurse. Wouldn’t latch without fighting it. Her doctor comes in, says more than likely the Zantac isn’t doing anything so quit giving it to her. Her weight gain is good (9lbs 4 oz!!) so we shouldn’t be terribly worried about that, but something is causing the discomfort. Then he whips out the two words I had really been dreading hearing: elimination diet. Cut out all the dairy in your diet, he says. Like, sure, dairy isn’t a major food group or something. (And don’t think I didn’t deal with a wave of feeling terribly selfish in that moment, so don’t come at me with judgment for that one.) I know it can be done and I know a lot of moms do it and to them I say, you rock. It just sounded like an immense challenge for me as I’ve never so much as gone on a diet, so I have no idea how to go about removing an entire food group (including “hidden dairy”) from my diet. Anyway, I don’t really need to justify to anyone other than myself and my husband why I didn’t want to do this, but it basically boiled down to trading one kind of misery for another. 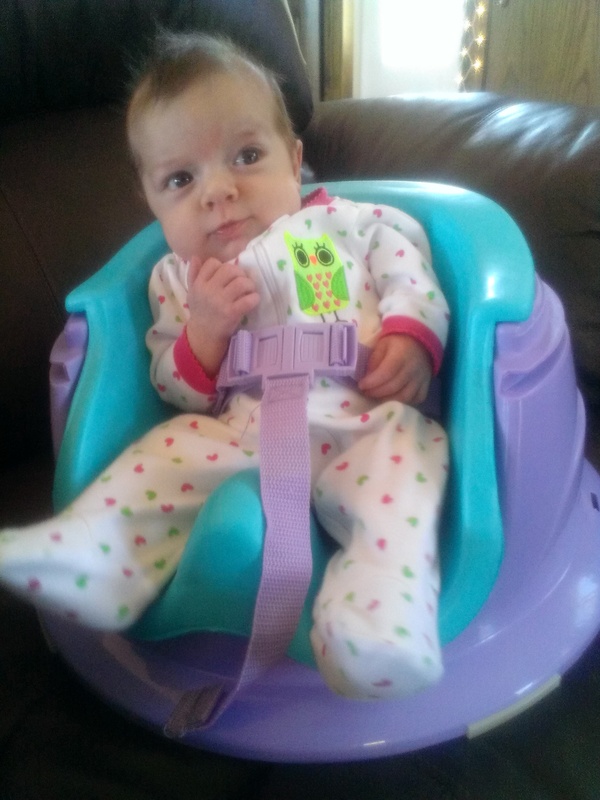 We discussed it and decided we’d try something for a few days: pumping and bottle feeding. And for almost 3 days now we’ve only had a smidgen of fussy crying in comparison to what we had been getting. She has slept through the night in 4-5 hour chunks and she smiles at everything. Earlier this morning I made breakfast and she laid on her playmat for a half an hour entertaining herself, babbling and cooing and grabbing at her toys. So I’m thinking it’s been a combination of things up to this point. She obviously gets gassy when she nurses because she fights the breast so much. She latches, unlatches, latches, unlatches, cries, latches and unlatches some more, so obviously she’s putting air into her tummy and she’s not getting full. On the bottle, she drinks down 4-5 ounces in one go, sits upright, doesn’t fight, and barely has to burp when she’s done. And the change in her is unreal. I have a changed baby and I didn’t even attempt to cut dairy out of my diet. Obviously I know that this change may not work in the long run, and I might end up having to go to the elimination diet eventually, but it’s working right now and I am not going to press my luck by changing that. I was sad at first that nursing may not work out, especially since pumping is so much work, but really, it’s a much better compromise than chucking the whole thing and going to formula. She’s still getting my breastmilk and all the advantages. It’s not the product that was bad, it was just the delivery method. I still get to feed her in the quiet of the night and let her rest her head on my chest and rock her back to sleep. And most importantly, she is happy. Which means that I am happy too. I keep looking at her thinking a fairy came in the middle of the night and swapped out my fussy baby for a happy one and I better lock our windows extra tight because I do not want to send this one back. Because seriously…isn’t it about time I get to spend my day with this happy girl?